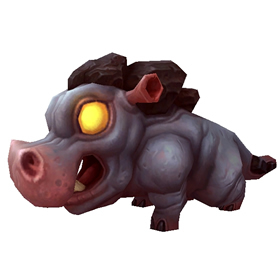 The Periwinkle Calf is one of four possible pet drops from Fel-Touched Pet Supplies. I believe that I have the H/P breed, but I'd rather have H/H. Deep Bite coupled with Stoneskin will add up the damage dealt over the fight duration. Although, the extra power could make up for the lost HP. All that's left to do it try it out in PvP. These playful little riverbeasts enjoy scooping up a large mouthful of water and then spitting it at one another.